It’s all go, go, go here at the moment. If you haven’t visited the Omlet club for a bit there is a new library section where you will find all the past newsletters as well as so called White Papers – here. Ok, ok they’re not that highbrow but they are fact sheets for eglu owners. And if that’s not enough why not have a peek in the galleries – here ? There are masses of great photos up there which don’t make it onto the star photo section of this newsletter. South of England Show 1st /2nd of October. Come down and dig the vibe dudes!! Izzy’s unusual nest box in the runner been pot. for attention after the chicken arrived! he gets to live in a gaint carrot. Hard to believe that any one could have something against you keeping a couple of lovely hens in your own garden! But I do get lots of emails from people asking whether there are any laws which prevent them from doing just that. I phoned my local council and after chatting to a friendly chap found out that there aren’t any bylaws in my county and that this is the case generally. He did point out that it is a good idea to check your house deeds or rental agreement in case there are any clauses which would prevent the keeping of chickens and livestock in your garden. This is rare but occasionally new houses and some older ones do have this written into the deeds. If this is the case, don’t despair! 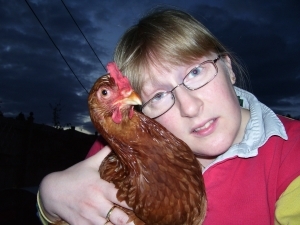 The only people likely to know or object to the chickens are your neighbours so it is well worth having a word explaining that the hens won’t be noisy, they won’t smell and that they might even get some eggs every now and then. 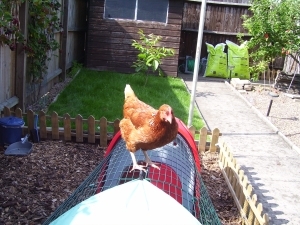 Thankfully most of the time no one minds and neighbours are often fascinated to see hens in your garden, you could even find that they volunteer to look after the hens for you when you go on your hols! 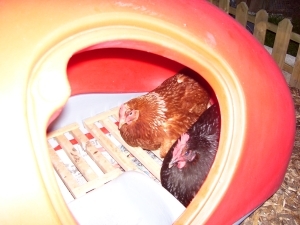 Desperate to get an eglu… but? Hobbies: Baking cakes, travelling and of course my birdies! What pets do you have? 2 chickens, 1 loach, 2 goldfish, 1 comet, 1 redcap, 1 fantail and will soon be getting a mussel! yes really! 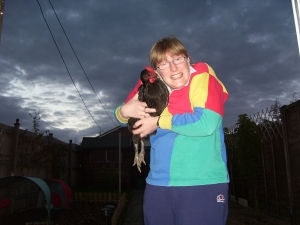 What do your friends think about you keeping chickens? They think its all a bit mad, but quite typical of me to do something that’s not the norm. What question have we missed? Do your neighbours think you are barking?? If Gordon Ramsey were to open a restaurant for chickens this would definitely be on the menu. Packed with only the finest ingredients including wheat, peas, barley as well as calcium, maize, natural vitamins (not synthetic) and linseeds to name a few. Chickens love it and if they have a bowl of these everyday it will ensure that they have all the nutrients they need to lay delicious eggs. This bag weighs 20kg and should last around 10 weeks for two chickens. . Please note that we have stopped stocking Marriages Layers Pellets, as the Organic feed is also in pellet form your chickens shouldn’t notice the change. If you would like any help or advice just give us a call.